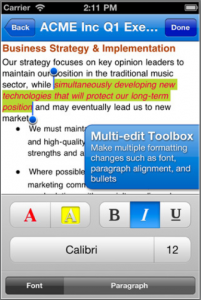 A Quick Review over My iPhone/iPad pick of the week: Quickoffice! QuickOffice Pro – My Small Business App Pick of the Week! I use Microsoft Office everyday. EVERYDAY. If your office runs on Microsoft Office and its capabilities, you need this app. Almost everything you do at the office can be done and seen from QuickOffice. It is a little of the pricier side for an Apple App, but for what it offers it might be worth it to you! Cost: $14.99 for the app right now on iTunes, a 25% savings for a limited time! If you have been trying other document editors but to no avail, look no further than Quickoffice! This one is so incredibly integrated and compatible for everyone that it is a must have for Office-based businesses. Why I like it: Like I said, I use Office every day. This app gives you the ability to do almost everything you need to on the road all with your finger! Let’s say you pull your latest projections and need to change this on your PowerPoint presentation that you have been working on, but you are almost to the meeting to deliver it. 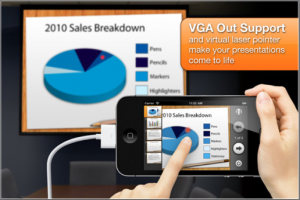 Now you can seamlessly change this on the presentation right from your phone. This kind of integration is the future and where the industry is headed. Business owners are travelling more and more and need to be able to get work done while they travel. I can’t tell you how many times I’ve been in a meeting and see people constantly on their phones trying to multitask. Also included was the Cloud Compatibility making you able to see all your documents all of the time. You can also turn your finger into a laser pointer that is directed straight from your phone! Your finger = a laser pointer! Other service providers include:Huddle, MobileMe, Dropbox, SugarSync, Google® Docs and Box.net. What I don’t like: The price is a little high. There are many apps with the same types of features for a much lower price. But I do think this app is worth the price to have a Microsoft-based app that can change with its programs and offer the best updates. It also apparently has had some rough updates in the past. It seems that many of the bugs are worked out at this point though. Is it for you? If you are on the road traveling quite a bit and use Microsoft in your office and business, this app is for you. For what it offers all in one app it is a bargain. Offered for Apple and Android. Overall: I think this is such a great app to go alongside Microsoft Office. Being able to edit any document from anywhere gives any small business owner a great advantage when news travels so quickly and changes in the blink of an eye. Stay ahead of the pack, get this app! This entry was posted in Halloo, Marketing, Sales, Small Business, Virtual Office by Leah. Bookmark the permalink.